The Stapp Car Crash Conferences are a living memorial to Col. Stapp's life of research and service. 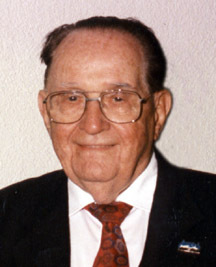 John Paul Stapp, Colonel, USAF, MC, Assistant for Aerospace Medicine, Advanced Studies Group, was born in Bahia, Northern Brazil, where his missionary father was president of the American Baptist College. At 13 years of age John Paul the eldest of four brothers, remained in America (when his parents returned to Brazil from furlough) to enroll in the San Marcos Baptist Academy in Texas. Subsequently, as an undergraduate at Baylor University he was an English major and a track team member but later switched to science courses because of his desire to be a doctor. After graduation he stayed on at Baylor for a Master's Degree in Zoology. He worked as an instructor in Biology at Decatur College, Decatur, Texas, for two years before going to The University of Texas for a Ph.D. in Biophysics. When he was 29, John Paul Stapp, Ph.D., entered the University of Minnesota Medical School, where he also taught and served as a research assistant, and earned the degree he wanted most: Doctor of Medicine. His duty as an intern was at St. Mary's Hospital, Duluth. In 1944, Dr. Stapp went on active duty as a First Lieutenant in the Medical Corps and began a career of research in aerospace medicine which has brought many honors to him and to the United States Air Force Medical Corps. His first assignment was to field-test a liquid oxygen aircraft breathing system. He spent many hours in unpressurized flight tests of the oxygen system at altitudes up to 45,000 feet. From subjective experience gained in this way, he was able to recommend preventive measures for high altitude bends, chokes, gas pains and dehydration. 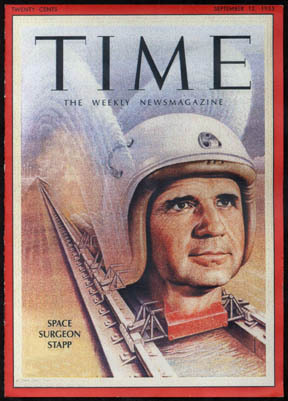 The first rocket-sled deceleration research program at Edwards Air Force Base on the Mojave Desert was Dr. Stapp's next project. (He had finished his required service as a reserve officer but extended his stay in the Medical Corps.) His assignment was to determine human tolerance to deceleration and protection from crash forces. The rocket-sled accelerated 1,200 feet on tracks to attain aircraft landing speeds, then was subjected to aircraft crash deceleration. Metal scoops beneath the sled plowed into a trough of water for the slow-down. Thirty-two rocket runs were made with a dummy passenger before Dr. Stapp took his first ride in December 1947. By May 1948 he had taken 16 rides in the backward-facing position, with g stresses up to 35 times the pull of gravity. This was double the stress that had previously been set as the limit of human tolerance. These experiments proved that backward-facing seats would give air transport passengers optimum crash protection. 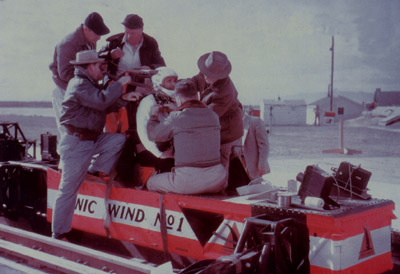 In June 1951 Dr. Stapp returned to Wright Field and, two years later, to Holloman Air Force Base in New Mexico where laboratory buildings, adequate equipment and a qualified staff to perform further experiments in biodynamics were provided. In 1954 he rode the "Sonic Wind" at 632 miles per hour, to a dead stop in 1.4 seconds. Colonel Stapp was subjected to more than 40 times the pull of gravity (40 G's), proving that windblast and deceleration of ejection from aircraft at 1,800 miles an hour and 35,000-foot altitude could be survived. Time Magazine called him "the fastest man on earth and No. 1 hero of the Air Force" (Time, The Weekly Newsmagazine, September 12, 1955). Colonel Stapp also received many awards and citations, including the Legion of Merit with Oak Leaf Cluster, the Air Force Cheney Award, and the Outstanding Achievement Award from the University of Minnesota. It was while at Holloman that Colonel Stapp noted that the Air Force lost nearly as many men in fatal auto accidents as in plane crashes. So, he began a car-crash study program, putting dummies into salvaged autos and projecting them into wood and concrete barriers. Human volunteers tested safety belts up to 28 g's or 4,800 pounds decelerative force. In May of 1955 at Colonel Stapp's invitation, some 26 individuals visited Holloman Air Base to witness the sled demonstration and auto crash tests as well as to participate in discussions on automotive design and safety features. They represented the Armed Services, universities, automobile manufacturers, research laboratories, traffic and safety councils, and medicine. The meetings were repeated in successive years of 1956 and 1957, and many of the safety features discussed and recommended were passed along to traffic experts and automotive engineers. Some of the recommendations included moving dashboards forward, with energy absorbing padding; fitting doors with safety locks so they would not fly open in a crash; removing rear window shelves; fastening seats more securely to car body; improving bumper design; and, of course, proving the effectiveness of seat belts. The impetus of the meetings also served to stimulate the public interest, congressional hearings, and several research projects at universities throughout the country dealing with various aspects of automotive safety. Such universities as Harvard, Cornell, University of California, Wayne State, University of Minnesota, and University of Michigan have made outstanding contributions in this field. Professor James J. Ryan, in the Mechanical Engineering Department of the Institute of Technology at the University of Minnesota, had been interested for many years in automotive safety design--or "packaging people," as he so aptly put it. It was during the fifties, while working on U.S. Air Force and Public Health contracts involving the biophysics of automotive crash deceleration that Professor Ryan formed a lasting friendship and working relationship with Colonel Stapp. Some of the research in transportation done by Professor Ryan was suggested by the Colonel. When Colonel Stapp was appointed to the Advanced Studies Group of the Aerospace Medical Division, his work took him away from Holloman and the car crash meeting was not held in 1958. However, the following year he asked Professor Ryan if the meetings could be resumed and held at the University of Minnesota. Professor Ryan requested the staff of the Center for Continuation Study to assist him in the planning and programming. At Professor Ryan's suggestion, the meetings held in 1959 were designated as the "Fourth Stapp Car-Crash and Field Demonstration Conference" in recognition of the Colonel's achievements. Invitations were extended to "safety engineers, medical personnel, research and project engineers and investigators, and others who may be interested in automotive safety." Seventy-one registrants and participants from 13 states attended the three-day conference held September 17-19, 1959. A conference was not scheduled for 1960, but plans for 1961 began more than a year in advance. The Fifth Stapp Automotive Crash and Field Demonstration Conference was held at the Center for Continuation Study, University of Minnesota, September 14-16, 1961. The American Association of Automotive Medicine was invited to participate. This Association scheduled its annual meeting to run concurrently during the Conference and their members actively participated in the presentation of papers and the discussions. Representatives of the Public Health Service of the Department of Health, Education and Welfare also participated, as did the American Medical Association's Committee on Medical Aspects of Automobile Injuries and Death, Section in Orthopedics. Thirty-two faculty participants contributed to the 1961 program, representing six universities, the U.S. Air Force, automobile manufacturers, traffic and safety engineers, seat belt manufacturers, private consultants, and public interest groups. In addition, 77 registrants from 20 states (not including those from Minnesota) as well as visitors from Sweden and the United Kingdom Scientific Mission took part in the discussions. In 1962 Professor Ryan gave Colonel Stapp the honorary title of Permanent Chair of the Stapp Car Crash Conference®. The title was honorary and accepted by acclamation. The 1962 Conference was again conducted by the University of Minnesota, but was held at Holloman AFB. The 1963 conference was hosted by the University of California at Los Angeles with funding provided by the United States Public Health Service. The 1964 Conference was conducted by the Biomechanics Research Center of Wayne State University in Detroit. The 1965 Conference was again hosted by the University of Minnesota. During these years, an "ad-hoc" planning committee had formed to assist in conducting the Conference. This Committee, which later became known as the "Stapp Conference Advisory Committee," recognized that the Conference had grown each year, so that by 1966 it was becoming unmanageable on an "ad-hoc" basis. The SAE had also greatly increased its activities related to automobile safety during that time, and offered to take over administration of the Conference and publication of the proceedings, with overall technical responsibility and conduct of the Conference remaining the responsibility of the Advisory Committee. From 1966 through 1998, the Conference has been hosted by Universities (Wayne State University - 8 times, University of Michigan - 6 times, University of California - 9 times, Harvard - 1 time, University of Oklahoma - 1 time), government agencies (Department of Transportation - 2 times, Navy - 2 times, Air Force - 1 time), and industry (Ford and General Motors, one time each). Conference hosts lead the Advisory Committee in peer review of submitted papers and conduct the Conference as General Chairman. Advisory Committee members review papers prior to acceptance for the Conference and assist in conducting the Conference as requested by the General Chairman. Until January 1999, the logistical, administrative, and financial aspects of the Stapp Conference were handled by the SAE, Inc. In April of 1999 the Stapp Association was incorporated and founded in honor of John Paul Stapp, M.D., Colonel USAF (ret.) whose pioneering research in human tolerance to high-g environments and the development of protective systems for ejection from high-speed aircraft and occupant restraint in motor-vehicle crashes, provided the impetus for the first Stapp Car Crash Conference and Field Demonstration in May 1955. The primary activity of the Stapp group has always been its annual Conference, which attracts between 450 and 550 international researchers and safety engineers evey year. The other activity of the group is the distribution of its publications to the scientific community. Each year, the Stapp Advisory Committee reviews abstracts of papers submitted for presentation at the conference and invites the authors of abstracts that are most in keeping with the goals of the conference to submit full papers for committee review. These papers may contain new data that support well-established concepts, may report on new methods and tools used to study mechanisms of injury, or may discuss controversial data and concepts that have not yet been accepted by the scientific community. Papers accepted for presentation at the conference and publication in the proceedings have been judged by committee reviewers to warrant publication in the open scientific literature so that the merit of the material contained in the papers can be evaluated by the greater scientific community. The Stapp Car Crash Conference® publications provide a historical record of progress in impact biomechanics research and in the development of improved occupant protection systems and injury assessment tools. Each year, the papers presented at the annual conference provide new ideas, thoughts and insights that add to the base of knowledge and that will hopefully stimulate new research and development activities in the years ahead.